Groundwater Remedial System Optimization - Noreas Inc.
NOREAS performed quarterly groundwater monitoring, remedial system operation & maintenance (O&M), and reporting for two separate fuel hydrocarbon groundwater plumes (Sites 43302 and 43260) at the Marine Corps Base, Camp Pendleton, California. The remedial systems were installed previously and have operated for some time. NOREAS prepared a work plan for continued groundwater monitoring at these sites. The work plan included a Navy approved Sampling and Analysis Plan (SAP). All work for this project met current requirements of County of San Diego, Site Assessment and Mitigation (SAM) Manual 2011, and requirements of the Water Board. Further, NOREAS performed three semiannual groundwater monitoring events at the sites, and installed additional wells to further delineate the extent of petroleum hydrocarbons in groundwater. Sampling was conducted using low-flow sampling techniques per SAM Manual requirements. 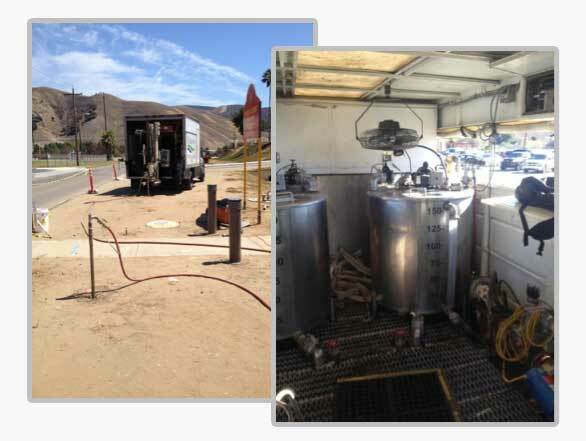 NOREAS performed continuing O&M of the ongoing biosparge remediation systems. During this period, we upgraded and optimized the systems for increased performance, reduced downtime, and for maximizing air/oxygen flow into the subsurface. Results of biosparge system progress were included in the groundwater monitoring reports prepared for each site after each monitoring event. Site 43260 has been granted full site closure. Site 43302 has subsequently been treated using ISCO and the site is now in the post-remediation monitoring phase.